Wow. You all have blown me away with your comments from my last post. I am reading through each and every one, working my way through and trying to reply to each one. If you didn't get a reply to your email, your address didn't come through to me when you commented, so I replied back on the post. But, I'm still working to finish some of the later comments up, too. A million thanks, I'll talk a little more about what y'all said in an upcoming post. 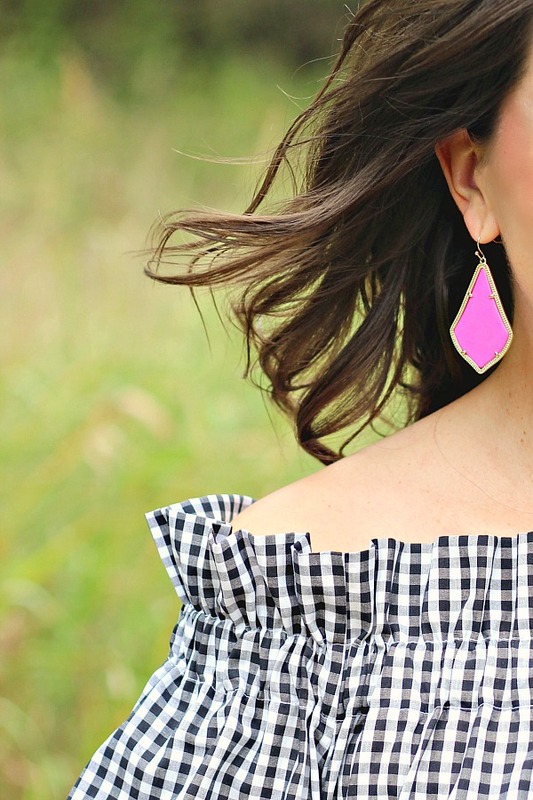 Collyn Raye is an Etsy shop that makes custom, Southern, lady-like wardrobe pieces, as well as a few accessories. 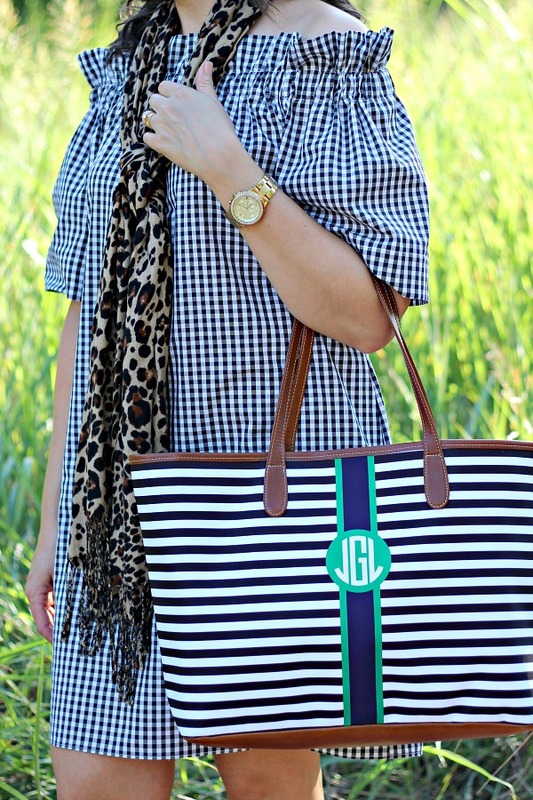 And, a good majority of the pieces are made from gingham, so how could I resist?? The owner and seamstress, Shannon, can even do a custom listing individualized for you if you need specific measurements or if you'd like to choose a different fabric from her selection than what you might see listed. I selected the "Derby Dress," an off the shoulder loose fitting dress that is ruffled across the top. The fabric is a nice, crisp weight, and although the dress is not lined, it is thick enough that I did not find the need to wear a slip with it. 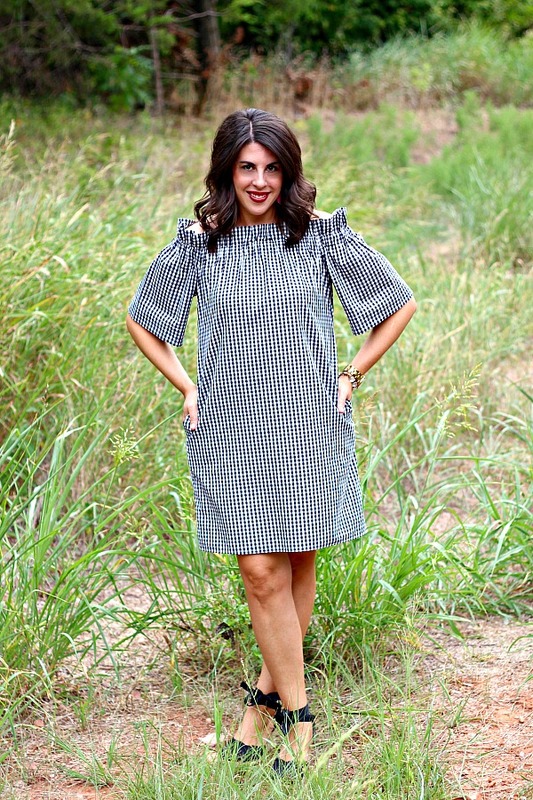 Although off the shoulder ("OTS") dresses and tops are super trendy this season, I found this to be a very versatile piece that I plan to wear well into the Fall. So, I shopped my closet and came up with three different ways to wear this dress, now and later. As I share these 3 looks, know that most of my accessories I've had since at least last year so I don't have exact sources for you. However, I've tried to find very similar options to link to in case you're looking for something similar. Case in point, I've probably had these ribbon tie espadrilles for 10 years(! ), but I found some pretty close that are linked below the photo. Just like in my home, I love that black and white is the perfect mix to combine almost anything with. 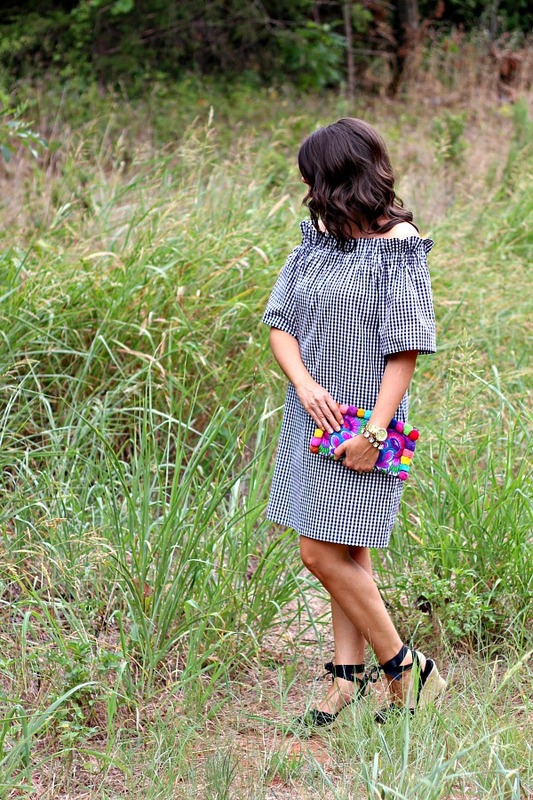 For this first look, I've kept a summer-y feel with a brightly colored clutch and earrings. One fit tip I did want to mention- I'm 5'7", and I let out the generous hem in the dress about 1 1/2" to make it a little longer for me. The measurements for the dress are in the listing, so just be mindful of the length if you're a little taller, and Shannon can add length if needed for a small additional fee. 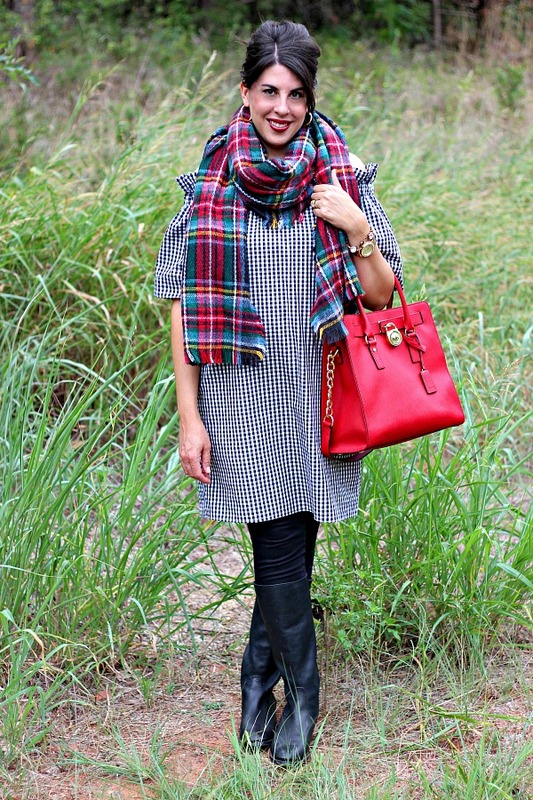 It could definitely be a darling tunic as is for you taller girls, too! Although it's late in the summer, I know I have at least another month with hot temperatures in Oklahoma so I can wear this dress just as is for a while longer, but I'll be able to layer it up a bit and wear it well into Fall as well. I've proclaimed my love and tips for mixing black and white with leopard, so I thought this was another good opportunity to try out that mix! 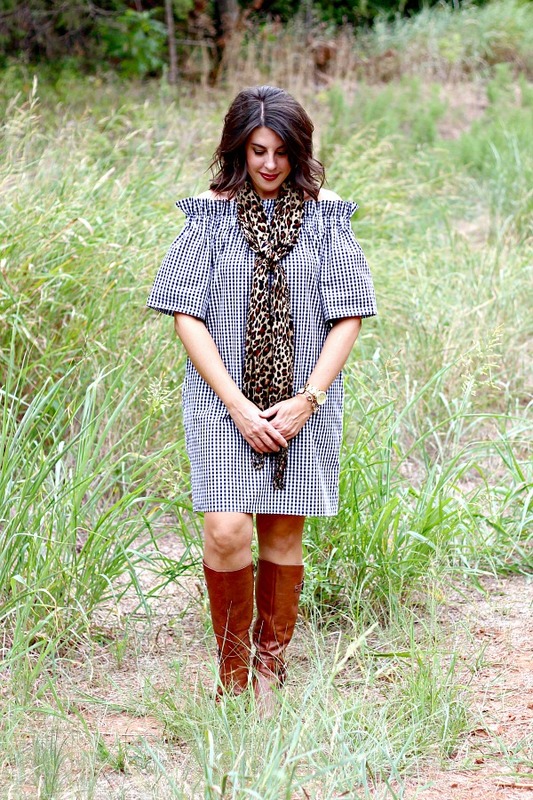 When the temperatures start to cool off a bit, I can add a scarf and boots to this dress. I chose riding boots here, but would also love a pair of cute booties with it as well (just searching for the perfect black pair for the coming season). My scarf came from Kohl's last year, but I think it's a pattern they might carry regularly. I couldn't find it online, so there are some similar ones linked below. I mentioned how handy this tote was in my post about the Haven Conference I attended, but I've been carrying it day to day as my handbag, also, so I wanted to talk a little more about it today. It's a roomy bag... I've actually been toting my laptop around in it- among other things #mombag- and am appreciating the sturdy leather straps, trim, and bottom. And, can I just mention all of the options that are available for customizing it? 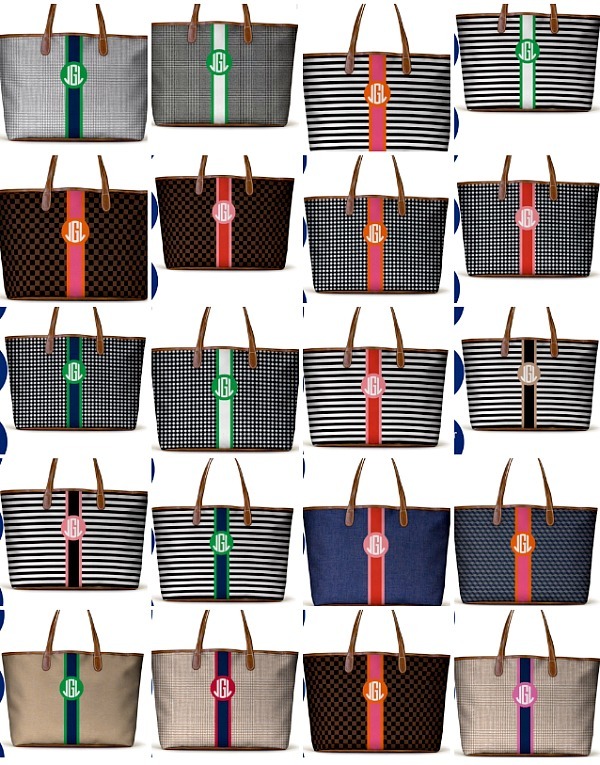 I love that on their website you can play around with what seems like a million combinations of bag fabric, stripe colors, and monogram styles to see exactly how your bag will look, it's almost like a game! :) I was looking at it on my phone so I took a screen shot of each option I tried... can you believe all of these? And that's only a few of the available colors! I ended up putting all of my favorite things together... black and white stripes, blue, and kelly green, and it goes with so many outfits! The third look I pulled together for this OTS cutie was for even slightly colder weather. One of my favorite outfit combos is a long tunic or dress and skinny jeans, and it works with this dress too. I paired it with a super warm blanket scarf (Target last year), skinny black pants, and black riding boots. 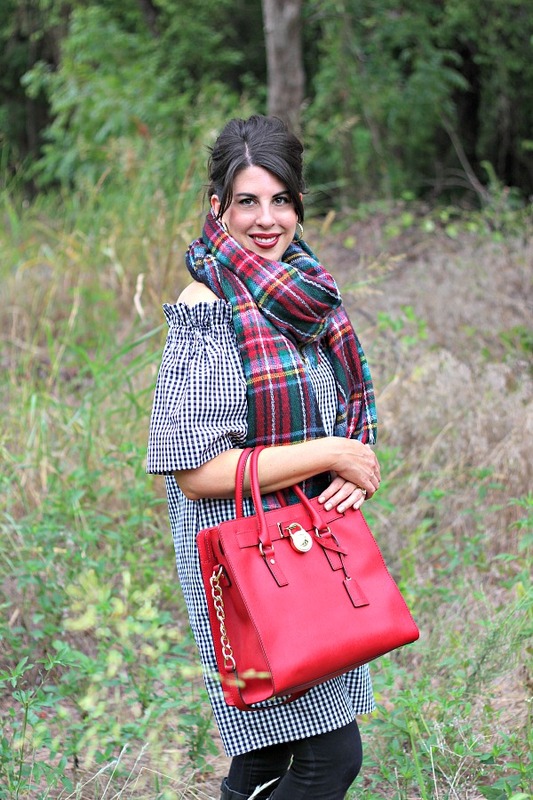 I'm telling you, those blanket scarves can keep you warm in sub-zero temps, ;) so even with the bare shoulders I think this would work in cooler weather. 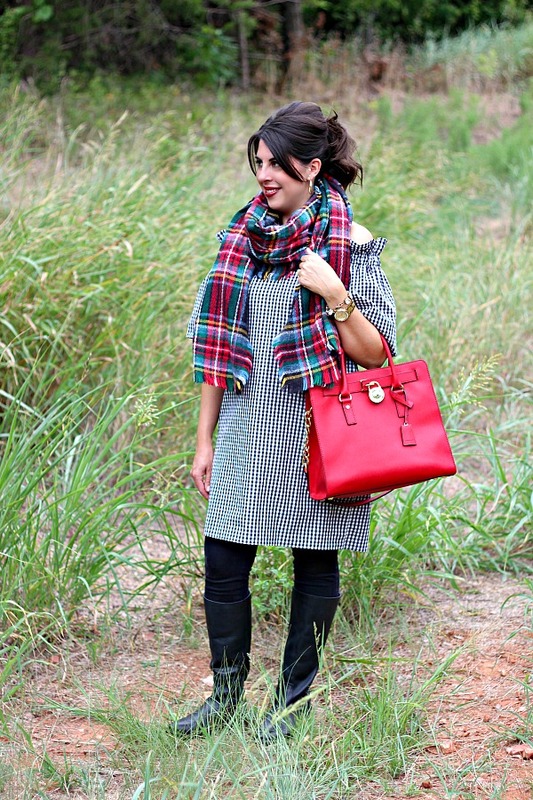 I couldn't resist the pop of red with my handbag, too. 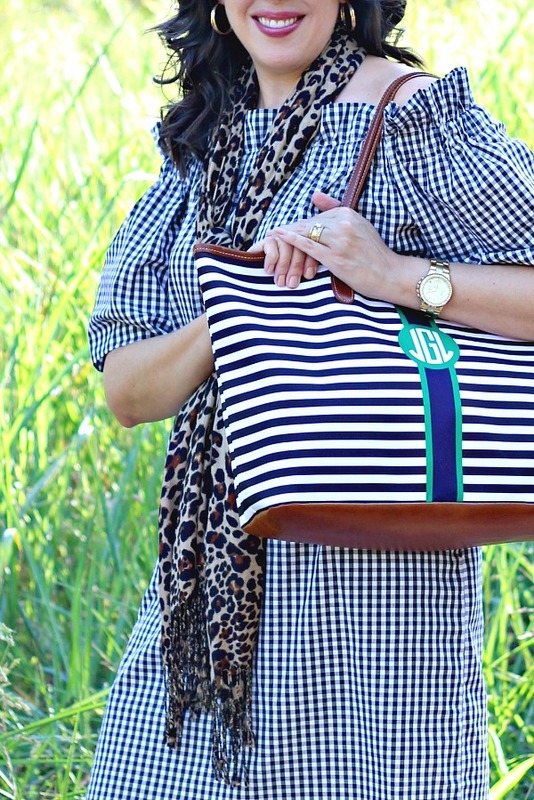 If you're a long time follower you know that I love to shop the end of season clearance sales at Dillard's, so this bag was a score last year and it's especially fun to carry seasonally- Christmas, Valentine's Day, and the Fourth of July! 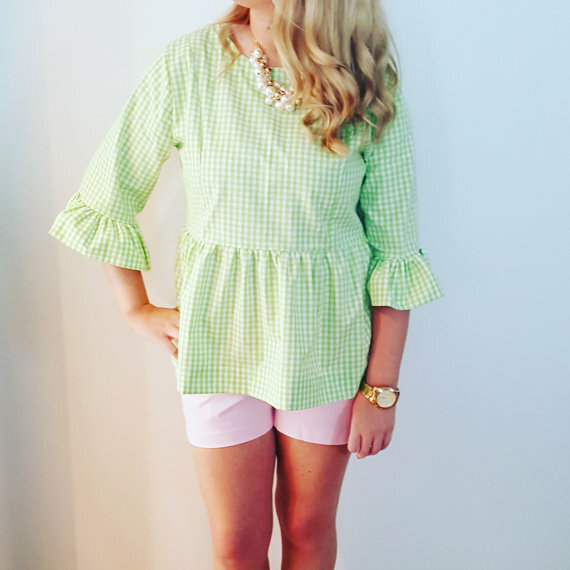 If you like girly, Southern style I hope you'll take a look around Collyn Raye and tell Shannon I sent you! I've got my eye on a Carolina top to try out next, isn't it a darling style too? 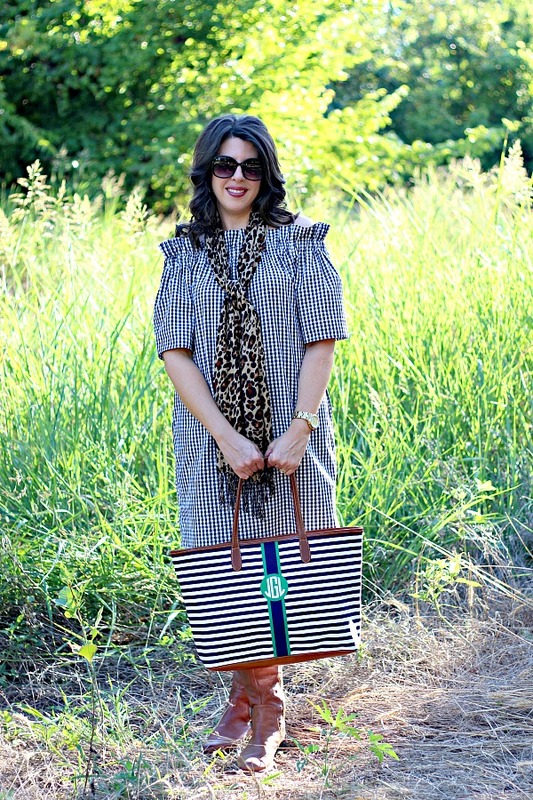 I love this dress and the way you styled it three different ways. And that top you have your eye on, it looks fantastic! i love this dress- it's perfectly you, and looks amazing on you! You look very cute in the dress. Can it be pulled up onto the shoulders? Thank you Tina. It could be worn a little higher than I have it, but probably not all the way up closer to the neck. With the deisgn of the dress, the armholes aren't cut large enough to wear it that way. That dress is darling, and looks great on you!!! I love this dress! Looks great on you! I've been wanting a Derby top too, I love the ots look, I have purchased several tops in this style. Thanks so much for sharing! Have a great night! You are adorbs! Love this dress! !